My Kombucha is finished and it turned out great. I kept thinking that it was molding but discovered it didn’t. It will produce stringy, slimy things and even black spots but that is not mold. Here are some good pictures of good and bad SCOBY’s. I allowed mine to ferment for 8 days and like the taste. The longer you ferment it the more sour it will become. Fermentation also depends on the weather, the colder it is the longer it will take to ferment. I strained my finished Kombuch before bottling it in mason jars and then put it into the fridge. You can also bottle it. It is a tad effervescent. I decided to pour a half glass and added filtered water the rest of the way. There is a small amount of alcohol created in the fermenting process but in the research I did it is about 1%. Most websites I read said to be careful how much you drink when you haven’t had it before, you need to see how your body will react to it. Here is a good website for more information on storage and use. 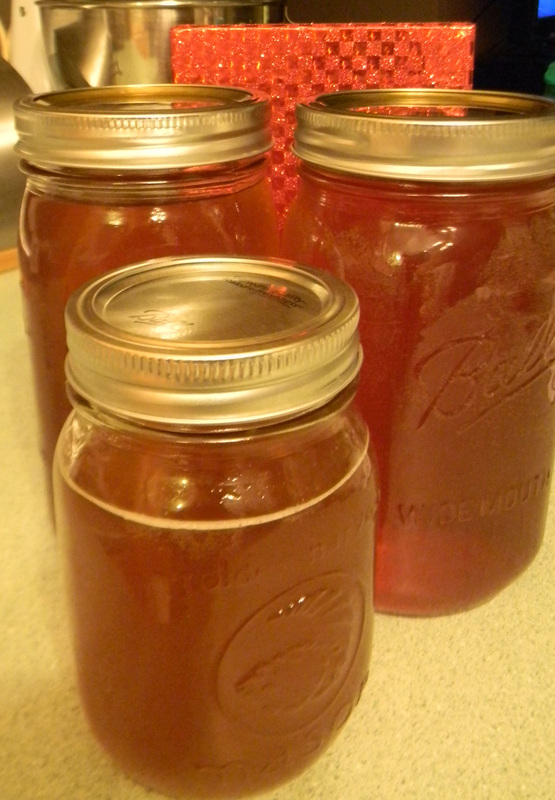 You can add flavors to your Kombucha and even double ferment with fruits but I think I will wait awhile to try that. This entry was posted in Drinks, Food and Drink, Posts and tagged Homemade Kombucha, Making Kombucha. Bookmark the permalink.